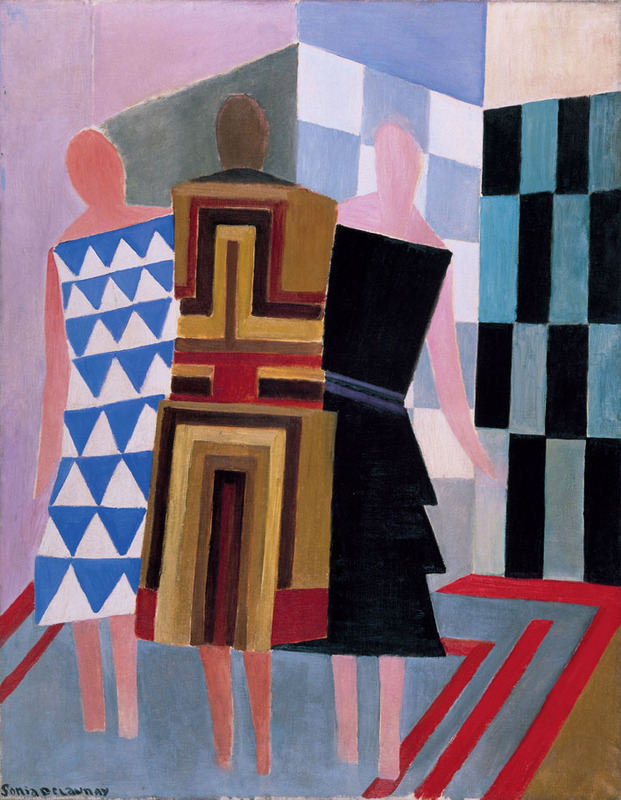 Whilst the world hurtled into the new, unexplored territory of the 20th century, Sonia Delaunay captured this frantic energy in her work. Scenes of modern splendour were transformed into a kaleidoscope of colours with street lights and dance halls disguised as abstract shapes. The stark, whitewashed walls of London's Tate Modern have become the home to over 10 rooms of work from Delaunay. This retrospective exhibition is mega and doesn't leave a stone unturned. Early paintings, with their Fauvist undertones are showcased at the beginning of the exhibition which goes on to display a vast array of her fashion and textile designs as well as her later work. Although not captioned brilliantly, the exhibition offers a visual timeline of the life and work of this fabulous lady. Looking at many of her paintings and especially her fabric prints, it is astonishing to see just how modern her style appears today. In fact, some of the fabric designs wouldn't look out of place on the rails of Whistles. It is truly mind blowing to imagine how innovative her work must have seemed, 80 odd years ago, at the time of its creation. The fashion and textiles room could have been an exhibition in itself. Every counter top and display cabinet was packed full of her exquisite coats, fabric swatches and examples of her signature embroidery stitch. Her designs have even provided influence for design houses such as Salvatore Ferragamo who showcased a selection of autumnal toned geometric prints for their AW15 collection. This exhibition is the ultimate mood booster. The bright colours and social history on display provide a much needed breath of fresh air for the Tate and helps to highlight the diversity of this amazing artist. Be sure to check it out before it ends in August. Have you been to see this exhibition? What are your thoughts?